Have you ever developed a concept in your mind, but had trouble recording it on paper? This can be especially frustrating when you're trying to design a house. We all have memories and pictures recorded in our mind that seem to be perfect for our own environment, but how do you turn those thoughts into working drawings? As a resource to help you turn conceptual puzzle pieces into communication tools, B & G has developed our "Home Design Baby Steps" to walk you through the process, including helpful tools you can print to help you visualize essential design components. Our hope is for this online tool to allow our clients to think through what is most important to them so they'll be better prepared to begin the design process. Start with Step One and take things at your own pace. Enjoy! How many bedrooms? What about a Basement? Is Master Bedroom near the Study? Garage on which side? Then generate a “block diagram” showing approximate relationship. Make a sketch - see Sketch Aid in TOOL BOX - You CAN do it. If you have plans of your existing house you can use them to tell us what you like or do not like. See Old House Aid in TOOL BOX. Use our “puzzle piece” gallery (in TOOL BOX) to get ideas that you would like to incorporate into your plan. What room sizes do you need or want? Compare with what you have to be accurate. See Room Size Average Aid in TOOL BOX. Pictures of things you like are always helpful. Identify in the picture what you like. For Example: "I like the front porch arch." See Picture Talk to Me Aid in TOOL BOX. HELP!! I STILL DON'T KNOW WHAT I WANT!! If this is where you are at, make some kind of block diagram to help communicate your ideas. It doesn't have to be fancy. See Help Me Aid (Includes Magic Questions Aid) in TOOL BOX. The result of this second baby step is to have some kind of Block Diagram or Sketch to Communicate your ideas. The exterior of the house is one of the major controllers of your design. The style of house will have a major input on how the house lays out. This is what B and G Drafting does for you. Don't worry about how to get the look you want, just show us pictures of what you like. See Hidden Design Controllers in TOOL BOX. Start to identify and list information, lot size, view, slop of the lot/property. List known problems: existing utility, big tree you want to keep, driveway location ... don't let these worry you - there is always a solution for existing difficulties. See Site Aid in TOOL BOX. Write down questions that you want to discuss. This is a major point - questions not asked may be the key to the best solution. See Typical Question Aid in TOOL BOX. If you have finished the basic in Baby Steps, you are ready to move on to the B and G Drafting process. Consider how you would like your new home to look. Bring any or all of the following information to your meeting with us to help us determine the exact items you are anticipating in your home. There is no need to worry with specific details such as window sizes at this time. These and other features will be discussed in particular at the second conference. a) LISTS: Write out a list of items you want in your home along with questions. Having your thoughts and ideas organized in a list will facilitate the process of your conferences and insure that desired items are not forgotten. b) SKETCHES: Free hand or block diagrams showing room locations are one of the most common ways to begin. If you have problem areas, don’t worry…we’ll take care of them. Details, such as walk-in closets, etc., are added by notes at the conference. c) PICTURES: Magazine pictures of photographs of houses you like are useful in determining the style you wish to achieve. d) PUZZLE PIECES: Get ideas from our library of plans. While you might not find the perfect plan for you, any parts that appeal to you from various plans will help get us started. e) OLD PLANS: Bring in plans from a previously owned home to show changes, likes or dislikes. Anything you have to help portray what you are wanting will initiate us on the right track. Make an appointment for a Preliminary Conference, bringing all your information with you. From your details, we will custom design your new home. Make your second conference appointment for returning the preliminary drawing for adjustments and consultation for Final Construction Plans. When plans are completed (approx. 10-14 working days from second conference date) you will be contacted with construction copies ready. Final payment is due at this time. You are now ready to build! REMEMBER: Plan ahead! Try to get your plans started enough in advance with us so that you have plenty of time to get bids, apply for loans, etc. after you receive them and before you need to start building. 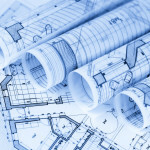 B & G Drafting - It's what we help you do. It’s all in the planning. These steps are very interrelated and co-dependent, yet seldom considered as such. To reach the target will take a team. B & G’s part in helping you “Build Great” is included in every job. 1 – Design: The art of it all. 2 - Correct Components: Right pieces in right places. 3 – Livability: Can you live “great” here? 4 – Durably: Will it last? 5 – Energy Efficiency: Predictable and management. 6 – Cost: is it in the Budget? 7 – End Result: is it in the budget? B and G Drafting helps you Build Great! We produce any type drawing you may need for you new home. Wither it be artist renderings, energy strategy, to technical details we do it. We add in the optional drawing as you need them. Tell us what you need, and we will help you get the answers. B & G Drafting has been a Missouri Architectural Corporation since 1983. Although our historic specialty since 1971 has been custom residential design, our services have grown through the years to include General Practice Commercial Architecture. One reason for this is the continued patronage of our contractor clients. As they became successful constructing B & G home designs, many grew into larger commercial developers. Through the years, we have expanded and retooled to provide personalized architectural services to our loyal clients. Your success is our success, and we are grateful for the opportunity to have served so many clients on multiple projects through the years. No two commercial architectural or engineering projects are alike. Whether you intend to construct a small "infill" of an existing space, build a new building, or create a master plan for a larger development, B & G has the resources and experience to provide guidance from the earliest stages. Call anytime to talk with a licensed Architect about the scope of your project and to learn if B & G is the right match for you. Energy efficiency is not a concept that you "add in" to a house, it is a core strategy that must be "designed into" your project from the beginning. In fact, the most cost-effective measures are chosen before any construction starts at all - even for portions of your home that are to be built with ordinary materials! On their own, each subcontractor or vendor might appear able to provide isolated advice about the efficiency of certain components of your home, but only a comprehensive analysis of how all the building elements perform together can assure results when you get your utility bill. This happens at the design phase, and a balanced approach to efficient design must be made and coordinated in all of your construction drawings, not just a few building systems. As designers, our objective is to help choose an energy strategy that makes your whole house perform as a balanced and integrated unit - all systems working together toward efficiency. How this happens differs for every design project, but we have assembled a few articles on the following pages to help guide your thinking. How to Spend your Energy Dollars - An introduction to some of the design variables for design efficiency. What Saves You More Money?? The answer is ALWAYS: "It Depends!" 6. Will insulating/sealing the crawl space or attic save energy? 7. Is the shape and orientation of the house on the property important? 8. Can I take advantage of passive solar benefits through window placement? 9. Does the type of Water Heater affect my overall efficiency? 10. Do my appliances really affect the total energy consumption significantly? 11. Are there some inexpensive construction "tricks" that always pay off? ...And the list can go on indefinitely with the same answer: "It Depends..."
Each question has a different answer when considered in the context of your values and your overall objectives. What you decide on any key component may also change the effectiveness of other issues. Everything is variable, but our job as designers is to help choose the most balanced strategy for the end results you are seeking. Insulation is critical to your home's energy performance. There are many different kinds with varying capacities. However, it is possible to forfeit all of the value of good insulation if your overall design doesn't support the insulating technology. For instance, a wool sweater is a great idea on a cold day, but it may not be effective when the wind is blowing hard. If that same sweater gets wet, it might be worse than no sweater at all! The application of insulating technology must be balanced with vapor and moisture protection, and the overall context of the installation. While it's true that a well-performing house does a good job of isolating the "weather outside" from the interior environment, it is equally important to provide the right type of ventilation to help assure good indoor air quality and moisture control. It is possible to build a house so "tight" that it doesn't naturally ventilate, but this can cause health risks to the occupants. Controlled ventilation air is needed to promote physical well-being, and exhaust is needed to remove unwanted moisture from the house. Air pressures can be an invisible enemy to efficient design. We seldom think about how air pressures affect a house, but they do. Wind, gravity, exhaust fans, clothes dryers, and HVAC systems can change the balance of air pressure on your home and "work against" any other energy control measures you have integrated. Any little "thermal bypass" that was overlooked during construction can become a major point of energy loss in a pressurized context; it can significantly affect the performance of the overall system. Remember, it doesn't take long for even a tiny hole in a rowboat to become a major problem to its overall performance! Solar energy can be an asset or a liability, depending on your specific requirements and energy strategy. In terms of winter heating, a good "Passive Solar" design can help your house capture free energy and temper your monthly energy bills significantly. Solar features don't have to involve expensive (or ugly) technology, the basic principles can be incorporated into any design with no loss of "style." When paired with proper site orientation and window technology, there's no reason why a house in our market shouldn't incorporate at least a basic solar-savvy design strategy. Heating, Ventilating, and Air Conditioning equipment has a monumental impact on your total energy consumption. The overall efficiency of available equipment has improved drastically, even in recent years. However, the level of investment in efficient HVAC equipment must be in balance with the overall performance of your home. It won't help your energy bill to put a high-efficiency furnace in a drafty house! At some point, your "efficiency dollars" need to be directed toward thermal/moisture protection, windows, appliances, and lighting. Investing extra money in any one system only pays off if supported by the overall design. The only absolute fact is that energy is NOT going to become cheaper over time, it will become more expensive. How you integrate efficiency technologies in your project will have a profound impact on your energy costs over the life-cycle of the construction. We at B & G have taken action to help our customers succeed and be prepared for the ongoing Energy Efficiency challenges that lie ahead. Wants & Needs - An overall look at reaching your goals. Designing houses is more than just "putting lines on paper." If your best interests are going to be represented, home design needs to be taken to the next level! The following are areas of concern for designing an energy efficient home. Many of these services are part of our standard "Builder Package," although we offer more thorough planning in many other interest areas. 1. What You Want - This is the most important part of planning, but it is tied to how much you want to spend for design and construction. 2. What Your Building Site Requires - This is all about the direction and slope of your property, views, and solar angles. 3. Geometry - Designing the overall shape of your house. It turns out that Ugly Houses cost about the same as Good Looking Houses, the difference is how carefully we plan the geometry. Room arrangements can be configured for the most efficient use of available space and materials. The basic Structural System must be considered from the beginning, because not all design spans cost the same to build! Last but not least, the Geometry of your home and arrangement of key mechanical components can have a profound impact on the Energy Efficiency. 4. Building Codes - Although there is some regional variety, most jurisdictions now implement the International Code Council series of building codes. We design to meet or exceed the intent of model building codes, even if your project is to be constructed in an unregulated area. Life Safety and Insurance costs are affected by quality standards regardless of where you build. 5. Reality - At the end of the day, your project must be constructed by available materials and the labor skill available in your area. Our objective is to constantly conduct a "reality check" for your design to make sure that the foundation, framing, HVAC and other systems seem compatible with common practices in the building enterprise. 6. Lifestyle - Home Design is more than just arranging spaces. It is about interpreting the occupants' preferences and lifestyle, and translating that into spaces. Your home design needs to consider the impact of children, big-screen televisions, entertainment patterns, computers in the home, and accessibility concerns - all for starters. We want your house design to respond to the way you live, not the other way around. 7. Resale - Even though your home should respond to your lifestyle, it must also consider the value system of the overall Real Estate Market. Even if you never intend to sell your home during your lifetime, plans can change. Nobody wants to be stuck trying to sell a "white elephant" project that is so unique that the market doesn't appreciate it. Even highly customized designs should consider their own marketability along the way. 8. Energy Issues - The cost of energy will always rise, so the value of good energy planning will always pay off! Today, it is possible not only to carefully design the energy strategy of a home, but prove how it performs through computer modeling and physical audits. 9. Field Testing and Inspection - We want to provide the necessary tools for our customers to know that what they have designed and constructed will actually perform in the real world. 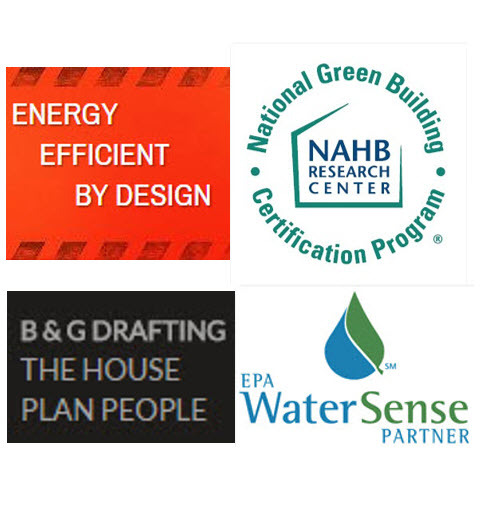 At B & G, we have a certified RESNET rater, NAHB Green Verifier, and have credentials with CGP, BPI, and LEED® programs. We can employ state-of-the-art testing equipment (computer controlled blower door, duct blaster, thermal imaging, etc.) to test your final construction. Testing verifies and encourages good construction practices, but obtaining the best test results starts with planning. Rules of Thumb approach will help, but it takes a full Strategy Study to build a working system with the correct balance of each component. If you "had to guess" on any particular aspect of energy-efficient design, this would be a good place to start. These "tricks" are not in any order, but some provide great long-term value compared to their initial costs. The B & G Energy Strategy Study (ESS) is available as an option for new construction and remodeling projects. This study would show how to translate these, and many other, design tactics into a comprehensive strategy for your particular design. 1. HVAC System - Minimum of 90% efficient systems, direct vented. Centralize the equipment location for minimal ductwork. Locate the ductwork within the thermal envelope of the house instead of crawl spaces or attics. ERV/HRV systems balance the air pressures for your home and provide improved air quality. 2. Orientation on the Property - Orient the house and window locations to optimize the effects of sun and wind whenever possible. This affects not only the energy consumption, but comfort, atmosphere, and longevity of some building materials. Site grading affects the potential for leaks in crawl spaces and basement. 3. Windows - Balance the window sizes for both views and efficiency. At a minimum, select Energy Star certified products with U-Values less than 0.35. Whatever you do, don't buy the cheapest windows - they are cheap for a reason! 4. Crawl Spaces - Insulate either the floor or the whole crawl space, depending on your energy strategy. Provide a well-installed vapor barrier against the ground. Carefully design how gutters and water removal systems will keep this space dry. 5. Water Heaters - Bigger is not necessarily better. Water heaters always present an energy efficiency challenge, but there are options to minimize the energy impact depending on your lifestyle. If employing tankless technology, install a water conditioning system as well. 6. Framing Tricks - Assure that all Energy Star Thermal Bypass preventions are in place. Provide proper water vapor and other moisture controls, including correct flashing at windows, doors, and roof intersections. 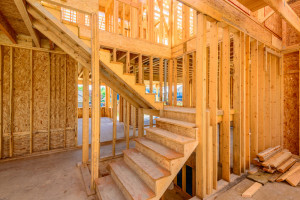 Certain advanced framing techniques can make the installation of insulation more consistent and effective. 7. Electrical Systems - Use ICAT recessed light fixtures and install correctly to prevent attic air from entering the thermal envelope of the house. Use CFL or LED light fixtures for at least 50% of the lights in the house, especially in main rooms. All exhaust fans should discharge to the exterior and be properly sized. Omit a whole-house attic fan system, or at least install one with an automatic power cover. 8. Floor Plan Tricks - Fewer corners and regular shapes can reduce the exposure to energy loss for outside walls. "Right-Size" the rooms, don't build extra space that you don't need. Shared spaces also share light, reducing the overall demand for windows and light fixtures. 9. Insulation - Meet or exceed the requirements of model building codes. Insulation upgrades are inexpensive, but they are not always the optimum use of funds. Assure proper moisture control for insulation areas, and always buy Grade 1 products. Caulk all possible air-leaks. Use the "Six-Side" rule: Insulation must be in complete contact of all six sides of any space and have proper air barriers installed. 10. Air Quality - Garage walls should have air barriers to separate toxins from the interior of the house. Crawl spaces can be detrimental to indoor air quality if not properly designed. 12. Safety - Install smoke detectors per code and provide a Carbon Monoxide detector on each floor and in the Garage. 13. Water Consumption - Low-flow fixtures are a must - they save you money in water purchased, water heated, and sewer costs. The latest version of low-flow fixtures (like toilets) actually work better than the old-fashioned versions that consumed so much water. 14. Appliances - Purchase all Energy Star rated appliances if possible: Refrigerator, Dishwasher, and Washing Machine. These are a few of the many components that must be assemble together correctly to obtain maximum energy savings. Almost all of your real cost-effective energy-saving features are determined before you start construction. Don't fail to plan ahead if you want the maximum benefit from the investments you make! There are different levels of commitment to approaching Design for Energy Efficiency. At B & G, we organize these services into several options to allow you to approach your design objectives at the most appropriate level for you. All of these service options are intended to be upgrades to our standard residential design service, and, when chosen, provide services and deliverable drawings that coordinate with our core design service. 1. A Collection of drawings to demonstrate important areas to properly coordinate in your construction project. 2. A personalized ESS book to guide you, your General Contractor, and Subs through the key issues. 3. Phone consultation for questions during construction. 3. Includes computer modeling of option-strategy concepts during design stage. 1. This is a full sustainability evaluation with certification from the NAHB Research Center to the ICC and ANSI Standards. We also offer complete services for LEED for Homes certification. We also offer complete services for Passive House PHIUS. We have a LEED AP for Homes and a LEED Green Rater on staff. If you what to build a Zero Energy House we use the Zero Energy tools plus we have a PHIUS Rater on staff. You want to be off the grid we will help you do it. Don’t throw big money at going off grid. Success starts with the first pencil stroke. Use experienced and proven design concepts. We know Zero Energy and have certified houses on the national level. We are not guessing, we have the computer software only available to a certified energy Rater’ Plus we have years of experience using it. We also offer complete services for Passive House PHIUS, plus LEED AP for Homes and a LEED Green Rater on staff. One of the few in the four state area. If you what to build a Zero Energy House with the EPA program, we have experience and use the Zero Energy tools plus we can use PHIUS rating expertise to prove you are on the right track. We have a Certified PHIUS Rater on staff. You want to be off the grid we will help you do it. the four state area and beyond since 1971.
communities, trades, and finance organizations. your project. As always, feel free to contact us if you have any questions or would like further information. B & G Drafting was founded in 1971 as a general drafting service in Springfield, Missouri. The drafting talents of its founders were utilized in a variety of applications, including residential design, mechanical drawings, patent drawings, and technical documentation of existing facilities. Long before computer-aided drafting had been developed, B & G Drafting was producing crisp, highly accurate drawings using the finest manual drafting standards. From the earliest commissions, the firm established a strong reputation for accurate and timely project delivery and for maintaining open lines of communication between all involved parties. At the same time, a special aptitude for residential design was emerging, and prominent residential developers chose this visionary new design company to bring fresh ideas to the Homebuilding Enterprise in Southwest Missouri. Over the next few years, B & G Drafting became a strong influence on the regional housing market, integrating market-sensitive designs, innovations, and economy into outstanding approaches to home design. In 1983, B & G Drafting became a licensed Architectural Corporation in the State of Missouri and expanded its roles to include commercial design and related services for area architects and engineers. The firm's special emphasis on quality Residential Designs continued to grow, however, and continually expanded, even to the present time, as the primary service offered. Today, B & G Drafting employs a talented team of architects and other professionals equipped with state-of-the-art computer-aided design systems and reprographic technologies. One of the firm's founders, Jim Baker, continues to lead the company as President and is the primary design consultant on most new projects. Our firm continues to grow and meet the ever-changing needs of an expanding community. Why Choose B & G? Building a new home can be a very satisfying experience - if you get off to a good start. B & G Drafting can help. We have carefully assembled BGDRAFTING.COM as a resource to familiarize our customers with the process of designing and building a house in Southwest Missouri, including our company, services, deliverables, and other resources. 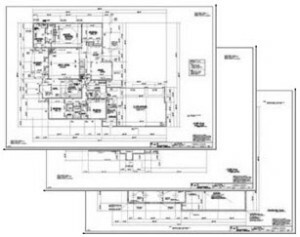 Our goal is to make sure you get the best possible design represented in sets of accurate construction drawings that are appropriate for our regional building enterprise. B & G Drafting strives to listen and respond to client needs and helps assure that the aesthetic, proportion, and geometry of your home design will exceed your expectations as you move forward into building phases. Thousands of clients have enjoyed the attention and quality services offered by this firm, and have experienced how our accurate, professional plans have been essential for a positive homebuilding outcome. Experienced clients and professional builders return to B & G because our Design Team helps reduce construction hassles before they start by thinking through critical design factors and producing house plans that have proven market appeal. Continuously serving Southwest Missouri since 1971, no other company in the area can surpass our reputation for providing residential designs that work. Top selling realtors report that they can identify homes designed by B & G because of the "professional quality" reflected in our well thought-out design. The B & G Design Team offers various levels of architectural services to meet your project requirements and budget. We hope that our online information will provide the answers you need, but we would be glad to answer any additional questions that arise before, during, and after completion of your project plans. We remain available to assist with any additional information needed to help you build your "ideal new home." Remember . . . a successful homebuilding project starts in the planning phase. Having your construction drawings prepared by the professionals at B & G Drafting doesn't cost - it pays! Plan to succeed! bgbuildinggreat.com will show you how to start an Energy Strategy Plan - an optional service by B & G Drafting. B & G Drafting, Inc.
We're all about HOUSE PLANS. WELCOME TO B & G DRAFTING. We're all about HOUSE PLANS. our “baby steps” on how to get started designing your new home or remodeling job. Tell us your needs and we will produce ​ construction plans for you . strives to listen and respond to your needs and helps assure that the aesthetic, proportion, and geometry of your home design will exceed your expectations as you move forward into building phases. Thousands of clients have enjoyed the attention and quality services we offer, and have experienced how our accurate, professional plans have been essential for a positive home building outcome. by thinking through critical design factors and producing house plans that have proven market appeal. a successful building project starts in the planning phase. at B & G Drafting doesn't cost - it pays! Plan to succeed! Preliminary Design Phase: Every project begins with an initial conference, either in person or on the phone. During this conference, our objective is to listen to your concerns and priorities about your home design. Based on our experience, we will guide you through a series of questions geared at understanding any basic design considerations that you may not have considered yet. Approximately a week after your initial conference, Preliminary Design Drawings [more info] are produced for your review. Intermediate Design Phase(s): Additional preliminary design cycles [more info] may be required if changes need to be visualized before "going final." This varies by project, based your preferences and the types of changes proposed. Production of Final Drawings: When the overall design has been established, our office produces Orthographic Plans, Sections, and Elevations [more info] that describe the geometry of your design. The number and type of drawings are dependent on the services ordered and the configuration of floor levels. The "How to Design" Team at B & G is your source for Great House Plans The way you want them! Energy Savings starts with the first stoke of the design pencil. These National Certifications get it right the first time. To find out more about Energy Computer Analysis call us - we do them every day. Most energy model we use are based the one Energy Star has developed based on a national standard with RESNET. The current model is assigned 100 points, based on building codes. This “reference model” is said to have a HERS (Home Energy Rating System) rating of 100. The Energy Star goal is to have a house with a HERS rating of 15% better than code (the lower the number the better). Houses built in the 1980’s have HERS ratings generally between 120 and 150 plus, older homes much higher. Those in the 1990’s are a little lower. Building codes around 2003 began to include energy standards that required conservation. It is fair to say that most houses before that are less than efficient. The strategy we will suggest can easily result in HERS ratings in the sixties and seventies being very common. We have seen them well under fifty. This strategy study has been assembled to produce the best energy saving answers using only the most cost effective choices. This proposal was assembled based upon the shape, size, orientation, location and details of your specific home. Success depends on the quality of the products used and the correct installation of the products into a correct system. The HERS number is based on a national standard with RESNET. It starts with code back in the 2003/2006 era. Your house built to this code would be assigned, by definition, 100 points. This “standard model” is said to have a HERS (Home Energy Rating System) rating of 100. Houses built in the 1980’s have HERS ratings generally between 120 and 150 plus, older homes much higher. Those in the 1990’s are a little lower. Local building codes by 2004 began to include energy standards that required conservation, but it is fair to say that most houses before 2004 are less than efficient. hat is a HERS Rating. A HERS energy rating on a house is more like golf than football. Football is loud, rough, and high score wins. Golf is quiet, skillful, and low score wins. Our goal is to produce a house with lower utility bills, better comfort, and avoid costly maintenance issues in the future. This is accomplished by developing a total system that works together. Like golf, there are many small and subtle things we can tweak. Experience always helps, but unlike any sport I have seen, our strategy can be pre-tested using computer analysis. In golf, minor adjustments can significantly help lower a score, and in building houses these adjustments are in shape, size, orientation, location, windows, insulation, HVAC equipment, and hundreds of other details that result in a score lower. It is not difficult to improve the rating, but at some point cost begins to be the limiter for any budget. What is needed is smart choices and correct energy saving building practices, not big money. A HERS Rating requires field testing of a house, Blower Door, Duct Blaster, measurements, insulation data, location of home, plus much more. The information is placed into page after page of input for computer analysis. The result is a computer model that produces a very accurate utility projection. I have modeled houses that have been within $5 of actual utilities. But, this is not the point. Once modeled we can change things like amount of insulation, orientation, efficiency of HVAC equipment, window quality… or whatever, to see how much it improves the product. The Energy Stagey Study was developed from past modeling of similar houses. 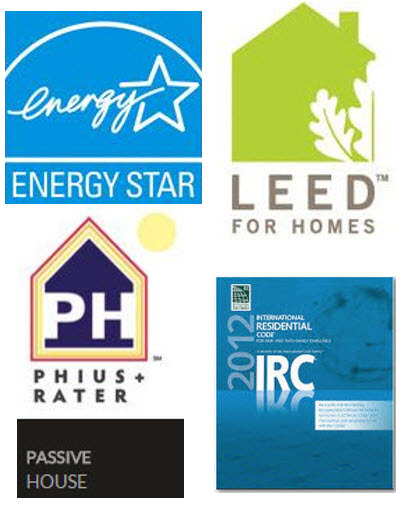 The HERS Rating is also required for the Energy Star Program, LEED for Homes, PHIUS, and NGBS. A HERS Rating can also be used to help meet IRC 2012 Building Code. There are also rebates and tax credits that require a HERS rating. Stop and think about what a rating of “70” means. That is almost a one-third lower utility cost. This means we can build three houses for about the same utility costs of two older homes. This is good news to a growing community. Price-wise, building new power plants is becoming impossible. More houses mean peak loads that eventually can't be met. Homes with low HERS Ratings do best in peak load conditions and outperforms normal construction, particularly in extreme conditions. A HERS rating of 70 may not bring thousands of fans to their feet with a thunderous applause, but if you listen closely, you can almost hear the sigh of relief as the homeowner scores another small utility bill. That’s reason for a standing ovation any day of the year! I seldom meet a chocolate chip cookie I do not like. Occasionally, I come across one that is to “die for.” You know what I am talking about, the ones that are so good they should be illegal. You would think that all chocolate chip cookies would be about the same. They all have flour, sugar, milk, and little chips of chocolate. But some stand out as unbelievably good, even when they are not just “fresh out of the oven.” What makes the difference? Is it the experience of the baker, the quality of ingredients, the kind of oven, or could it be the recipe? The answer of course is yes to all of the above. If any one of the things is lacking, the result may not be as expected. Even an experienced baker will fail with bad ingredients or a lousy recipe. Those “to die for” cookies might be an accident, but my guess is they come from master chefs who make sure that every component of the process is perfect. This is why master builders like the ENERGY STAR program. It provides them a master recipe with built-in quality control to produce highly efficient green homes every time. There are several areas or ingredients in an ENERGY STAR home. The right combination of each of these areas has been tested and proven over the last decade or so. Those who want to produce the most efficient house possible, start by making a few choices, such as type of insulation and kind of HVAC System. The remaining ingredients for a great house depend on these first two, and thereafter each new choice helps select the next component. As we all know, the results heavily depend on the final step, like the heat of the oven for cookies and the sweat of the brow for a house. But, it is here that a big difference appears. A bad batch of cookies has a short life, but a bad “energy hog” of a house lives on for years wasting money. Unlike a master chef, a master builder does not enjoy the liberty of much experimentation. That is where the ENERGY STAR Programs provide the proven recipe. There are two paths a builder can take. A prescriptive path, based upon years of testing (over a million houses) or a performance path with the aid of a HERS Rater (HERS = Home Energy Rating System). The HERS Rater is credentialed by RESNET to assist the builder in making the correct choices. He brings the testing tools, such as the Blower Door, Duct Blaster and third party experience to the project. Specially trained HERS Raters are certified to run the approved computer modeling and checklist for ENERGY STAR that can analyze each component of a project, proving which combination of materials will provide the best results. It is a little bit like having your cookie and eating it too. With very little added cost, a home owner can have a house that uses less than 50% of the energy of other new homes, and a small fraction of the utility bills of older homes. So as the saying would go, if you don’t like the chocolate chip cookie you are making, get a better recipe. LEED for Homes is from USGBC which is known for their transformation of commercial architecture into the successful green buildings we see everywhere. While all the rating systems are similar each using building science, rating checklist, inspections, and experience, LEED for Homes adds several exceptional tools to the art of building energy efficient residential projects. LEED for Homes requires two teams that work together. The project team led by the design team, LEED AP and general contractor works with an experienced Green Rater and their providership. Many of the areas require licensed professionals. This raises the quality of the end product to a very high level. Professionalism and accreditation is required. Most professionals involved are required to have years of extensive training, experience, and accreditation. Durability issues move from being hidden in the checklist to being installed. Durability issues must be identified and solutions preplanned. Then there is a final inspection with accountability forms. The often neglected things, like pest and moisture control, are moved to the front of the list to a place of importance. The result is a house that has a long life expectancy and better sustainably. Material Resources becomes formulated with required preplanning. LEED for Homes requires accurate preplanning on the purchasing and delivery of framing material. If extra material is ordered and shipped, it is often wasted in unnecessary framing practices. Framing details require that the structural system be preplanned, not shade tree engineered by wasting lumber. Education for the homeowner and the general public is built into the rating system. The single biggest issue with efficient green building systems that we can build today is that nobody seems to know they exist. It starts with those builders who do not have enough working knowledge of building science to apply it, to the home owner that does know the questions to ask, or use green concepts. Green is just a mystery. LEED for Homes provides the tools needed to get the information in the hands of the people who need it most. Owners and General Contractors work with the LEED for Homes checklist. All involved can purchase a copy of the extensive LEED for Homes Reference Guide. This manual gives details on all levels for the Green Requirements. Energy systems can be rated on one of two different paths. Using Energy Star and HERS ratings or a LEED for Homes based on the project and people involved. The result of the extensive planning, inspections and rating is a Certified, Silver, Gold or Platinum certification. This system adds value to the project in proving the level of sustainability the project achieved. The years of easy maintenance, comfort, heath and energy savings are predicted by this certification level. There does the National Green Building Standard verification system fit in the process of building an energy efficient house? I have often compared ENERGY STAR homes built by master builders to the delights of a master chef who prepares meals to “die for.” The experience of a master, the quality of ingredients, the right equipment, and most importantly the correct plan or recipe produces extraordinary results. It takes all of these things to produce great chocolate chip cookies OR great houses. So where does the NGBS rating system fit in? It’s easy. The NGBS is more of a full meal deal than just a nice house, a gourmet meal that is. Home Innovation Research Center (known before as the National Association of Homes Builders Research Center) has a proven program that goes beyond an energy efficient house. It is like a complete meal with all the extras. Inside the NGBS (National Green Building Standard) we find that ENERGY STAR is still the core of the energy section. But there is much more. Lot Selection and Construction - gives guidelines for choosing the best possible site and directions to protect your site as you improve it. Resource Efficiency – guidance on selecting the correct reproducible path and how to protect what you built from old, wasteful practices. Energy Efficiency – based on ENERGY STAR recognized principles with lots of added prescriptive concepts and guides. Water Efficiency – showing step by step techniques proven to save a valuable resource. Pollutant Control – aids in the unseen area of good air quality and moisture control. Operation and Maintenance – through owner education and a collection of material provided to the owner on how to keep the efficiency of a green home at an optimum level. Each of these sections is broken down into points, 600 + with minimum requirements in each category. This helps keep the project in balance. It is easy to focus all the attention on one area, like energy, and forget about sustainability. This is a major issue today. If left out, time and nature can ruin all the extra work on energy. This is so important that ENERGY STAR has recently added sustainability issues, like water management to its rating system. NGBS has always had it, and provides detailed credits to keep water and moisture out of the places it can do harm. For example, I have seen many damp and wet crawl spaces resulting from lack of attention to certain details during the first day of construction. Issues easily avoided, but often overlooked. The NGBS (National Green Building Standard) ICC 700-2012 is the only ANSI approved rating system for residential construction. It is connected to the professional builders of the NAHB and building inspectors with the ICC (International Code Council). But the system is for anyone to use. The rating system is what I call “builder friendly” in that it is written in the way contractors work. This rating system is written by builders for builders, based on the latest building science principles with a local third party verifier who is overseen by the Home Innovation Research Center in Maryland. A gourmet meal, like a well-built energy efficient house, is comprised of various components that must work together. The ICC700 Standard gives the recipe, the builder provides the experience, and the third party verifier provides the inspections (without being connected financially to the project). This is how we determine how green is green, or how efficient is efficient. The result of the rating is a national certification ranging from Bronze, Silver, Gold, to Emerald. •	Rebates and tax credits. They do exist but they come and go. Ask at the time of construction, but don’t count on them. •	Increased value for your house. This is big, but not as big as it will be. Real Estate appraisers have been slow to get on board with what is happening. Their methods require comparison to other houses. The new, high-tech houses are not found in every neighborhood so it makes it difficult for them to make an evaluation. This is starting to change. New reports are suggesting 10% to 25% increases in value are becoming common. •	RESNET reported that 50% of all new houses built in 2013 had a HERS Rating. The gas mileage sticker on a new car has changed the automobile industry. Who would not want to know the energy cost on a house before they bought it? This is why the HERS Rating is becoming the national standard that is driving the housing industry to a better product. The dollar amount of savings to a home owner is staggering over the lifetime of a house. The question is, “How do you know?” Green construction has many important benefits but it is like a nickel to a young child. Because the nickel is bigger it should be superior to the dime. Some things look more valuable than they really are. So a home buyer can easily be led to focus on one feature that is easy to see, but not have a clue about the real efficiency of the home. The house has a Green feature, that’s good, isn’t it? Well, it depends on the feature. As a home buyer, I want to know how “green” is “green”. Is it a gray “green” or is it the color “green” of a dollar bill that I will be saving? Energy efficiency is not visible to the eye. The features that produce the greatest savings are hidden, un-glamorous things that make no sense to an untrained eye. In fact it takes thousands of dollars of testing equipment, a comprehensive inspection, computer analysis, and experience to know how a house will perform. And to be fully accurate, it takes a third party to evaluate objectively. This is why a proven rating system is necessary. There are actually many rating systems out there. On a national level there are several major systems/codes that can be used. They all have a different focus and viewpoints with unique features, but the core issues are all the same. 1. 2009 IECC or 2012 IRC - ICC Building Codes. This system is based on minimal requirement by law. It is a prescriptive method for efficiency. 2. HERS Rating by RESNET - A comprehensive inspection and computer evaluation that accurately predicts the energy usage of a house (similar to MPG sticker on a car). This can be done on any house with a HERS rating of 100 being a code built house based on 2004/2006 code (R13 wall, R38 Ceiling, SEER 13 AC…) being the bench mark. The lower the HERS rating the more efficient the house. Your house is listed in a national registry for future resale. 3. Energy Star Certification - This system exceeds code by at least 15% and adds rigid nationally approved requirements using a HERS rating as a guide to performance. Now in version three with new, major bench mark improvements from years of research, over a million houses have been certified by the Energy Star program. 4. 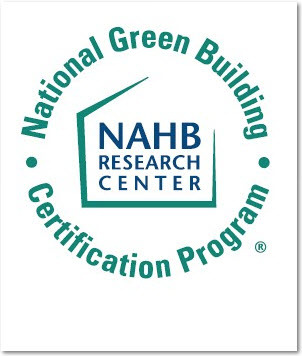 National Green Building Standard, NGBS, by the Home Innovation Research Center (new name for the NAHB Research Center) with the ICC700-2012 NGBS ANSI standard. An in depth verification system using a HERS Rating and Energy Star certification with over 600 areas of computerized verification giving a rating of Bronze, Silver, Gold or Emerald. 5. LEED for Homes by USGBC. A LEED for home certified house requires the most training and experienced raters. This system also uses Energy Star and a HERS rating, but adds durability inspections, material usage monitoring, and extensive education opportunities to the public. There is a range from Certified, Silver, Gold or Platinum for levels of efficiency, and sustainability is determined using a comprehensive computerized check list. The system also requires certification of the experts, and accountability forms to guarantee quality. LEED for Homes is one of the most rigorous and well known rating systems. 6. There are even systems to help guide you to NET ZERO, off the grid efficiency. Passive House Institute helps produce houses with a HERS rating of 10. At this level you can seriously be off the grid if you so desire. There are not many of these in the USA. They are more common in Europe. B & G has a PHIUS Rater on staff. Each of these systems has a focus and emphasis. While they all overlap, each provides a different viewpoint. Some houses undergo multiple ratings at the same time. These rating systems will give a clear and comprehensive review of the house’s efficiency and why. These national systems tell us what color “green” the house really is. With a rating system the real value of the dime is made known over the nickel. With these rating systems the buyer can know what they are getting. It levels the playing field. It is like the new car market where they make an SUV which is 5% more efficient than last year’s model. It is “greener”, but a 12 MPG car is not nearly as efficient as a 50 MPG car. Each of these Rating Systems produce a better house. The rigorous details of each system demands better performance from all subcontractors and suppliers. While a HERS Rating can be made on any house, it is possible to fail with Energy Star Three, LEED for Homes, and PHIUS ratings. Even if a house fails to obtain a certificate, the HERS Rating is established. So why try, if you can fail? I have only seen a couple of houses fail a rating system. Most errors can be corrected. The end product, even when a house fails, as a result of the demanding rating system, has a superior HERS Rating and actual performance in the real world. The point of failure was not significant in the performance of the house, just a mandated requirement of the rating system not met. These rating systems are not for everyone. But, those that use them end up with the most efficient house possible. The certificate establishes the house as superior for the time of a future sale. It goes back to the old concept of no effort, no gain.